Hardcover, 5.5 x 7.5 in. / 168 pgs/ 49 duotone. The year 2006 marked the 400th anniversary of the birth of one of the greatest portrait painters that ever lived, the Dutch seventeenth-century master, Rembrandt. Although Rembrandt is among the most important artists in western history, and perhaps our greatest draftsman, no one has ever, until now, been able to pinpoint exactly how it was that he so precisely and effortlessly captured the spiritual essence of his subjects. 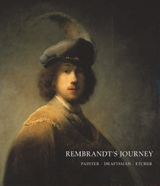 This insightful, sophisticated and yet accessible illustrated reading-format study, written by the preeminent scholar and translator Michael Taylor, will be as enlightening and delightful to Rembrandt scholars as to lay readers. Taylor looks at Rembrandt's self-portraits, his society portraits, historical paintings and biblical scenes, and identifies how it was that the artist rendered his subjects so alive, so full of earthy, flesh-and-blood vitality--which all boils down to his treatment of the nose. 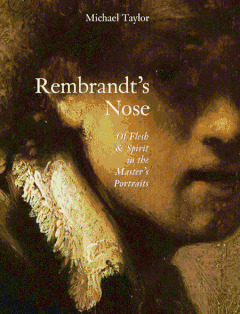 Rembrandt's Nose is a gem of a book, an intimate, candid and extremely entertaining engagement with the works of art themselves, interwoven with racy historical snippets that contextualize the artist's breakthroughs and techniques. 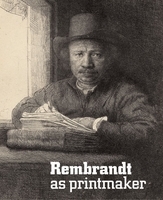 It includes some 49 reproductions, as well as a complete chronology of Rembrandt's life. "Michael Taylor creates a series of portraits that are as full of ingenuity, passion, and attention to quirky detail as Rembrandt's paintings themselves. Art history has seldom been so entertaining and enlightening." --Ross King, author of Brunelleschi's Dome, The Judgment of Paris, and Michelangelo & the Pope's Ceiling. "Michael Taylor's starting point for this enchanting essay is a feature that is as plain as could be, and is central to the destiny and the mortal features and aspirations of his great subject, the painter. Taylor's meditation unfolds with grace of language and insight, and a familiar use of what can be known now of Rembrandt and the world he revealed." --W.S. Merwin, former Chancellor of The Academy of American Poets and recipient of the National Book Award and the Pulitzer Prize. "Zooming in on the center of Rembrandt's faces, Michael Taylor finds meanings we all have missed. What appeals to me most in his lyrical appreciation is that he writes not only about what Rembrandt's noses look like, but also how they smell and breathe." --Gary Schwartz, author of The Rembrandt Book. "This is the best kind of criticism: informed without being pedantic, passionate but elegant, witty and earnest at the same time…It is worth a whole stack of weighty tomes on the master." --Mark Polizzotti, Publisher, The Museum of Fine Arts, Boston, and author of Revolution of the Mind: The Life of André Breton. Taylor proves a joy to read. 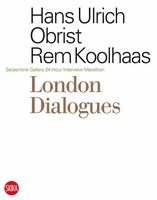 Hitherto a translator of French poetry, he has made himself thoroughly at home with the art historical evidence… and he deftly unfolds a life story in précis around the self-portraits and such pictures as the Bathsheba. Taylor's eye seems to keep pace with Rembrandt's brush, here brusque, there punctilious; his diction is chunky and sensual; he loves to imagine, to cast similes, to surf whatever breakers of emotion the picture rolls his way…. Peering so keenly, Taylor does indeed touch on the quick of the art, and yet the mystery of its relation to the culture around it stays intact. At just under six by seven inches and 170 pages, Michael Taylor's Rembrandt book is a perfect stocking stuffer for the casual art lover. In an engaging, suave style, Mr. Taylor ponders the most protrusive part of the human face, which assumes in Rembrandt's portraits and self-portraits a palpably fleshy and often emotional presence. More than just a gimmick, Mr. Taylor's nasal approach is a way to insist on Rembrandt's down-to-earth corporeality, which can be obscured when the focus is on the formal or the spiritual. Mr. Taylor's view is not as irreverent or subversive as his title promises, but for readers not already well versed in Rembrandt scholarship, it will serve as a fine introduction to his art and life. 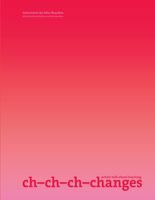 Essays by Clifford S. Ackley, Ronni Baer, Thomas E. Rassieur and William W. Robinson. FORMAT: Hardcover, 5.5 x 7.5 in. / 168 pgs/ 49 duotone.